The webcast will discuss four ways to make your business more productive and efficient. The four areas to be discussed will be standardizing processes and procedures, leveraging technology, ensuring proper accountability and improving continuously. 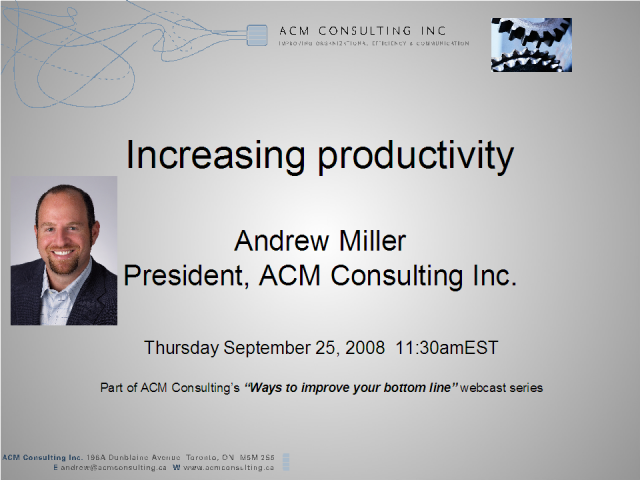 Andrew Miller, President, ACM Consulting Inc. This webcast will provide you with 3 or 4 tangible ways for you to increase your companies revenues. This webcast will cover some basic ways to help you influence people. No mind tricks or fancy theories, just some ways to help you influence people in all walks of life. This webcast will discuss different things that organizations can do to help retain employees. This webcast will cover the basics of Strategic Sourcing and provide you easy ways to gain procurement savings in your organization. The webcast will discuss four principles of leadership and how they apply in tough social and economic times. The four principles are: communication; inspiration; determination; and accountability. - practical tips on how to improve your business. Presented by: Andrew Miller, President, ACM Consulting Inc.